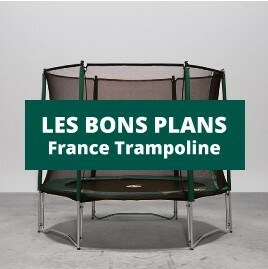 France trampoline has chosen several fun games for your trampoline. They will make your afternoon trampolining sessions with friends and family even more enjoyable. Do not hesitate to take a look at our wide range of games, which will thrill your children! Come and discover our fun range of games for trampolines! Trampofootball, tramposcratch, fun balls and juggling balls, try all of the different activities on your trampoline. Giant chalk will allow your children to develop their creativity, they will be able to strass their drawings over and over again on the jumping pad of the trampoline. Do not forget about our birthday packs for a fun birthday party. If you want to spend a night on your trampoline then you need the igloo tent! Trampoline games There are 24 products. Kids basketball hoop designed for trampoline use.